This time of year means open enrollment season and that means battling a consistent bevy of confusing acronyms: FSA, HSA, HRA, PPO, HMO, POS, and on. Reorienting every year to the different meanings, rules, and benefits of these acronyms is akin to relearning the scoring rules of curling every four years. Most Americans are interested to learn just enough to follow the sport or make an acceptable open enrollment decision but not so much that they could explain the rules back to someone else in detail. The purpose of this entry is not to explain the intricacies of the vice skip or the hammer strategy in curling. That is better left to your Canadian friends. Instead, the intent is to address what experience suggests is the most overlooked and significant acronym opportunity of open enrollment season – the health savings account (HSA). you were already convinced that a high deductible HSA plan will not fit your needs. If you are still reading but you are convinced that a high deductible health plan (HDHP) coupled with an HSA is not a good fit for your unique situation, you may be married to some misguided and costly objections. I use a lot of health care so a high deductible plan is not going to be cost efficient. We occasionally hear this concern and the supposition makes sense. If you know you’re going to incur large healthcare expenses in the future, you would seem to benefit from choosing a low deductible plan, ex-ante. However, insurance regulation coupled with HSA tax benefits for high income earners have flipped this logic upside-down. For nearly all individuals or families who are able to make a maximum HSA contribution ($3,350 single, $6,750 family in 2017), the high deductible plan will be advantageous, regardless of medical expenses. To demonstrate the basic math, I took a real world scenario – private marketplace plans available in Georgia for my family. As in many states, ACA regulations have driven every independent insurance company in Georgia out of the market except one (Blue Cross Blue Shield). Resultantly, the options are very limited and that makes this evaluation simpler. 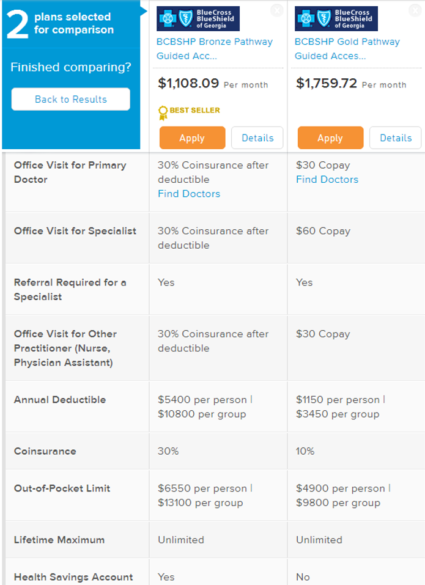 The two plans above show the lowest deductible option and the highest deductible option. The monthly premium saving of the high deductible health plan (HDHP) is $652. Over a year, that translates to savings of $7,820. Additionally, the ability to contribute to an HSA reduces income taxes by $2,363 assuming a marginal state plus federal tax rate of 35%. In this case, the HDHP starts the year with a cost advantage of $10,182. 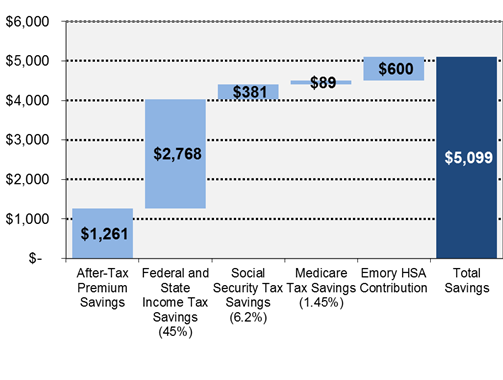 The chart below shows all levels of medical expenses on the horizontal access from $0 to $100,000 and the resulting economic gain or loss from buying the HDHP versus the low deductible plan. 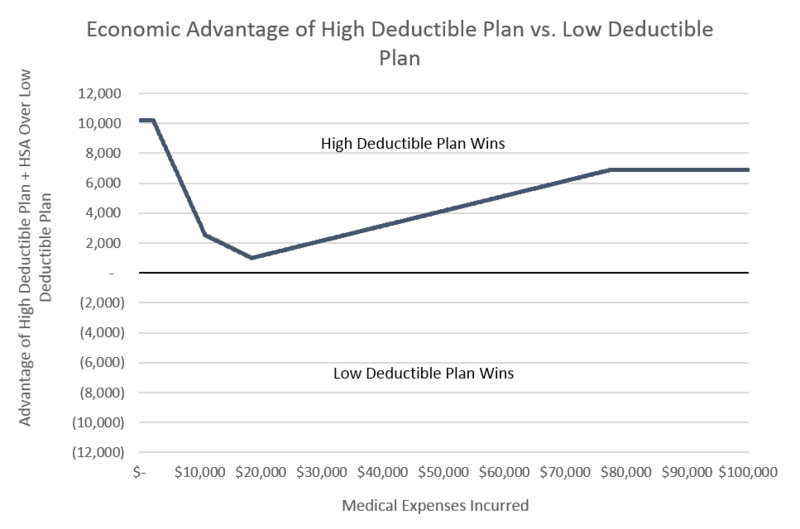 Anything above the zero axis is a win for the HDHP, anything below is a win for the low deductible plan. What should become quickly clear is that no matter how much my family incurs in medical expenses during the year, the HDHP beats the low deductible plan and it really is not even close. Additionally, this analysis intentionally takes the worst case scenario for a HDHP – not one but two family members have extreme medical costs. If just one family member were to incur high medical expenses, the numbers come out even more in favor of the HDHP. There’s another kicker in favor of the HDHP – increase the combined tax rate to 40% or 45% and the win gets bigger. Even at a 20% tax rate, there still is not one scenario where the HDHP loses. We have run these same calculations for several real life situations (both individual and family plans) and have continued to find the same results. I have subsidized employer coverage and premiums for the traditional health insurance plans are almost as cheap as the high deductible plan so why not choose the low deductible plan. This is another seemingly rational argument – on the surface. Yet in digging into the numbers for large employers, the high deductible plan tends to nearly always win for high income families – regardless of medical costs. As an example, the plan comparison below is from a large Atlanta employer – Emory University. The high deductible HSA Plan costs $171/month for a family versus $362/month for the traditional POS option. Families in a 45% combined tax bracket who choose the “HSA Plan” and make maximum contribution start off the year with a $4,499 advantage coming from lower premiums and tax savings. Like many employers, Emory provides an added incentive for employees to use the HSA Plan – a $600 employer-funded HSA contribution. Add it all up and HSA plan users start with a “lead” of more than $5,000. Since the difference in out-of-pocket maximum expenses between the two plans is only $1,400 ($6,400 HSA vs $5,000 POS), a family that incurs six figures worth of medical expenses will still come out ahead by $3,699 with the high deductible plan. So while the difference in premiums between the two plans may not seem like a lot, the HSA plan still comes out far ahead even when medical expenses are extreme. We have run this math for several large employers and find that it holds for nearly all family plans when the family has sufficient cash to make maximum HSA contributions. I’m worried about what happens if I fund but don’t use my HSA. Despite contrary myths, an HSA behaves very much like your checking account. You choose which of more than 300 HSA providers you want to use. You spend from it when you want, but you’re not forced to ever spend from it. At the end of the year, the money doesn’t vanquish and you’re not forced to use it. The money just stays in your account (and, if you are wise, it grows). When you die with funds still in your HSA account, the funds also do not vanquish. The HSA assets go to your chosen beneficiaries, just like your checking account. People often confuse an HSA with the use-it-or-lose-it FSA. The HSA is never use-it-or-lose-it so this should not be a factor when you’re evaluating health insurance options. My employer already oversees my 401k and I don’t want them overseeing another account (HSA). Many employers let you choose your own HSA custodian and simply send your payroll deductions to the HSA you choose, just like the direct payroll deposit at the bank account you choose. Some employers, alternatively, work with a single HSA custodian where your HSA payroll deductions are deposited. Unlike a 401k plan where you’re generally trapped with whatever custodian the employer chooses until retirement or separation from service, you’re permitted to move assets from one HSA provider to another at any time. Don’t like the HSA custodian your employer uses because the fees are too high? Wait until the deposits hit and then immediately move the funds to your HSA custodian of choice. I am not sure my doctor will work with a high deductible health insurance plan. Actually, most doctors strongly prefer high deductible plans because they get paid at the time of service rather than having to submit claims and wait for payments from the insurance company. Remove this from your list of reasons to avoid an HDHP. When it comes to high deductible health plans coupled with HSAs, too many people ignore the option or simply believe that for anyone who uses a significant amount of medical care, these plans won’t be cost effective. For families who can afford to make a full HSA contribution ($6,750), the benefit of the tax deduction combined with the premium savings tend to make HSA plans worth your consideration this open enrollment season. If you’re interested in how to turbo-charge your HSA for even more benefit, read this article we wrote in 2014.